The 1929 dime value is at a minimum of $1.25 - rising with the silver it contains. However these old Mercury head dimes are avidly collected today and many are valued higher. Your coin is worth a premium if determined it is in better than average condition. Collectors and dealers follow a process know as "grading" as they evaluate the condition of coins. 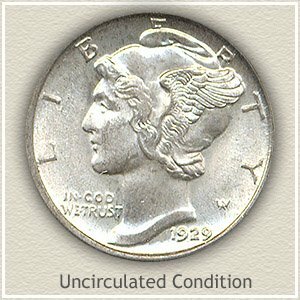 Most old silver dimes survive today in worn, circulated condition, a well preserved coin is the exception. An appealing coin still looking "new" is uncommon and one any collector of Mercury dimes is interested in adding to their collection. Pictured is a very nice uncirculated 1929 dime with minimal marks and a great strike sure to draw interest and is a $16 or higher example. Additionally, separate values are placed on 1929 dimes depending on the mint producing the coin. Three locations, Philadelphia, Denver and San Francisco struck dimes and mintmarks found on the reverse identify each. 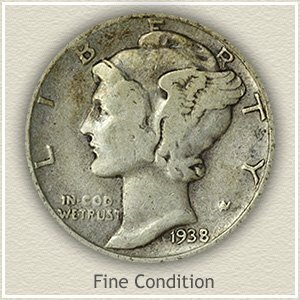 Finding how much your 1929 dime is worth by locating mintmarks is covered in detail below along with grading images to judge its condition. A mint marked 1929 dime is slightly more elusive than the Philadelphia coin. The San Francisco mint used an "S" mark and Denver a "D" to distinguish dimes struck at their facilities. Both mintmarks are found on the reverse along the rim. 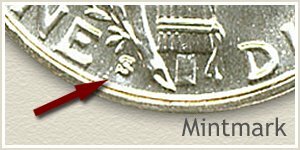 If your dime is without a mintmark it was coined at the Philadelphia mint. Once worth 10 cents when minted this now rare 1929 Mercury dime recently sold at a David Lawrence Rare coin auction for $1015. Surviving until today in near perfect condition the desirability of such coins is evident by the high price paid. Having lustrous original surfaces with a light golden wash along the rims is a strong visual plus. A bold rendering of the designs by a strong strike at the mint adds to the desirability of owning a high quality dime. Also necessary for a coin to rank as gem quality, it must be free of noticeable nicks and marks. Your old coins, mercury dimes or any of the others are valued by originality (never clean your coins), amount of wear and amount of scuffs, marks and nicks to the surfaces. The popularity of collecting Mercury dimes has put a large demand on all dates in the series. As a result of this search for quality, value differences due to condition are becoming greater. In their search for the right Mercury dime to add to their collection, collectors judge the condition of each coin, know in the hobby as "grading." Different stages and amounts of wear are separated and given a grade. 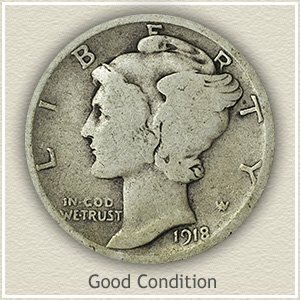 Examine the quality of your coins, comparing them to the images and descriptions, giving an accurate value of your 1929 dime according to its condition. Good: A considerable amount of metal has worn away leaving Liberty as an outline in low relief. Faint suggestions of separation are found in both her hair and wing. Confirming a "good" grade is the rim blending into the tops of the lettering and last digit of the date. 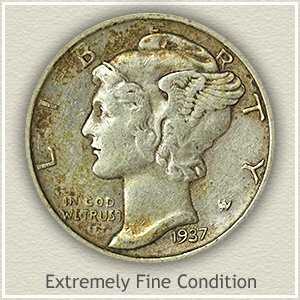 However, old Mercury dimes in this condition and the affordable 1929 dime value serve as a starting point to many collections. 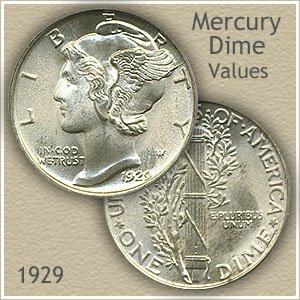 Values listed for the entire Mercury head dime series including more on the 1929 dime value. Rare and valuable dates are scattered through out the series contributing to a large spread in Mercury dime values. Additionally, the condition of your old dime plays a key role in today's rare coin values. One of the most popular and widely collected coins today. Spanning over two hundred years of US dime production and literally hundreds of date and mintmark combinations. Examine your 1929 dime value and all these small potential treasures. Coin Values Discovery... finds 1929 dime value and... all old US coin values. It is an excellent index, follow the images and text links to all coin series, from Cents to Gold. Value charts, alongside grading images to judge condition, determines how much your box of old coins is worth.